The US Postal Service® has many different mail classes ranging from regular First Class Mail® letter delivery to overnight expedited services such as Priority Mail Express®. Here is a breakdown of each USPS service to help you choose the right mail class for your mailpiece. Swipe right to see entire table * The USPS does not guarantee delivery times for any service except Priority Mail Express. ** Prices listed are discounted rates available for online postage vendors such as Stamps.com. † First Class Mail has many size and weight restrictions. Get more information on USPS First Class Mail Characteristics. Low-cost and fast — great value for letter mailings. Pricing not affected by distance. No fuel or home delivery surcharges. Maximum weight is only 3.5 oz. First Class Mail letters are not eligible for USPS Tracking. When to use First Class Mail: If your mail is less than 3.5 oz. and you do not need overnight delivery, use First Class Mail. 1–3 day delivery nationwide for packages. A variety of flat-rate options to simplify shipping. More expensive than other lower cost USPS mail classes. Less expensive options, such as First Class Mail, may be equally as fast. When to use Priority Mail: If you are shipping more than 13 oz., Priority Mail is a great shipping option for fast delivery at a low price — the USPS even offers free packaging! The only USPS method with guaranteed delivery dates. Most expensive USPS Mail Class. When to use Priority Mail Express: If you need your package to be delivered as fast as possible, regardless of price, use Priority Mail Express. If delivery can wait a day or two, First Class Mail and Priority Mail are much cheaper options. Cheapest shipping service for anything over 13 oz. Pricing is based on weight, not distance. Much slower than most other mail classes. Content must be books, sound recordings, recorded video tapes, printed music, or recorded computer-readable media (such as CDs, DVDs, and diskettes). When to use Media Mail: Perfect for media such as books or DVDs when lower shipping rates are more important than delivery speed. Inexpensive pricing based only on weight (not distance). When to use Standard Post: Use Standard Post when your content does not qualify for Media Mail and lower shipping rates are more important than speed. 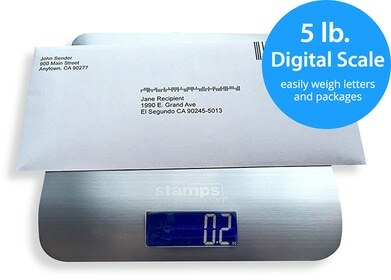 With Stamps.com, you can print postage for any USPS mail class without a trip to the Post Office. Customers also have access to discounted postage rates for Priority Mail and Priority Mail Express, SCAN form printing, and the ability to import order data from ecommerce marketplaces such as eBay®, Amazon® and other popular shopping carts.